The biggest update yet to Rovio's award-winning fowl-flinging space physics game sees the return of an inflatable hero, the appearance of the big (the operative term) boss of the sugary planet of Utopia, and a secret level loosely based on the most beloved puzzle game of all time. There are 20 new levels to conquer in Angry Birds Space 1.2.2, and the newly spaced-out orange bird is a small and then big part of the party. He'll prove invaluable for blasting asteroids into enemies, tearing apart fortifications from the inside and just generally making a big ol' nuisance of himself. Speaking of big ol' nuisances, the pig boss of Utopia is so fat — (how fat is he?) — so fat he has his own gravitational pull. And then there's the new golden space egg. I won't tell you where it is (you'll see it) but I will show you what the level it unlocks looks like. Man, there's just never enough long pieces. 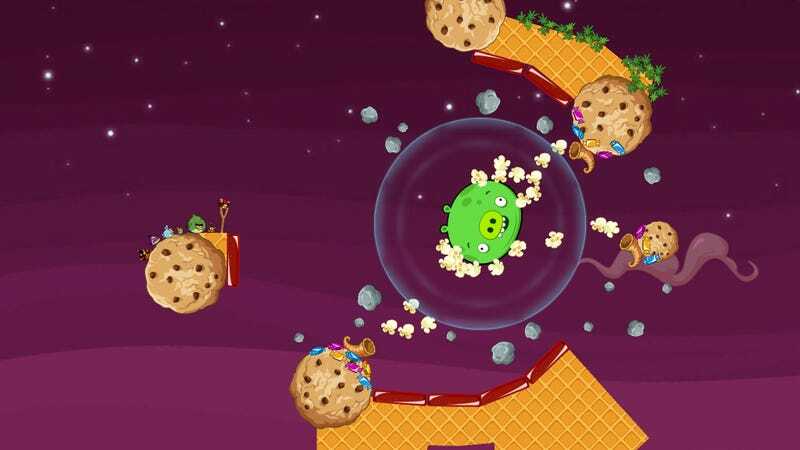 The latest Angry Birds Space should be available on whichever platform you play the game on as we speak. Why aren't you playing?